Skull-A-Day is the creation of artist Noah Scalin. It began on June 4, 2007 as a personal daily art project and went on to become an international community of skull fans sharing their art. The site was edited by Abby Davis, Justin "Tatman" Lovorn, and Citizen Agent between 2009 and 2014. This blog is now an archive of the complete project from 2007 – 2014. Skull-A-Day also exists on Tumblr, Twitter, Facebook, and Google+. Noah Scalin made a Skull-A-Day for a year. He started by making an orange paper skull on June 4th, 2007 and posting it online saying, "I'm making a skull a day for a year". He made his 365th skull on June 2nd, 2008 (and even posted a bonus skull the day after since it was a leap year!). In October 2008 a book based on the Skull-A-Day, featuring 150 images from the first half of the project, was published by Lark Books. It's called SKULLS and while it is now out of print, you may be able to find a used copy at your local independent bookstore or online via Amazon.com or Powell's Books. June 3rd, 2010 marked the start of Skull-A-Day 4.0 in which the project continued to feature daily skull submissions, but with the addition of one more site editor: Abby AKA Azurafae, who also made her own year of original weekly skulls (which you can see HERE)! June 3rd, 2011 marked the start of Skull-A-Day 5.0. To celebrate the 5th year of the project Noah committed to making 100 skull paintings. June 4th, 2011 was the the first official international Skull Appreciation Day. See some of the fun that happened that day HERE. June 4th, 2012 was the start of Skull-A-Day 6.0 as well as the second official international Skull Appreciation Day, which was celebrated with a one-day exhibition at Philadelphia's Mütter Museum. See what happened HERE. June 4th, 2013 was the start of Skull-A-Day 7.0 as well as the third official international Skull Appreciation Day which was celebrated with an exhibition at the International Museum of Surgical Science in Chicago, Illinois co-curated by Noah Scalin and Vanessa Ruiz of Street Anatomy. You can see what happened HERE. June 4th, 2014 marked the start of Skull-A-Day 8.0 with the continued help of editors Abby and Tatman. In August 2014 the site was transitioned to an archive of the project (2007-2014). 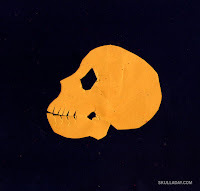 October 2014 Chop Suey Books Books publishes a brand new Skull-A-Day book featuring all 365 of Noah's original skulls. Get your copy HERE. To see all of the original skulls by Noah Scalin go HERE. Additional skulls by Noah are HERE. More about Noah Scalin can be found on his personal site, at his art & innovation consulting firm Another Limited Rebellion, and on the MakeSomething365.com blog.